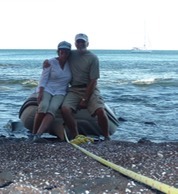 Sequitur - During our 20,000 nautical mile sailing voyage from 2009 to 2012 we added over 150 posts on the SailBlogs site. Our wanderings in Mexico, the Galapagos, Peru, Chile, Argentina, the Falklands, Uruguay, Brazil and the Caribbean appear to have become a resource archive; the Sequitur blog currently receives 1500 to 3000 page views per day. ZonderZorg - Our adventures with the 1908 skûtsje, Nieuwe Zorg began in July 2012 with a trip to the Netherlands to look for a barge. 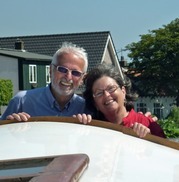 We continue the blog of our wanderings here as we transform her into Zonder Zorg and go cruising. A Day in the Life of Zonder Zorg - Edi posts a daily photo with some commentary on current events and happenings with our skûtsje, sprinkled with reminiscences from her past in the Netherlands, South Africa and Canada.